Back in August, I shared my latest Smash book that I'm working on. The title/subject for this Smash Book is our puppy, Coco. You can watch the video here, if you like. I bought the Retro Blue Smashbook, because I love the soft blue color on the spine. I love to use Smash books because there's no right or wrong way to add things to the book. Also I use my scrap paper and that saves me money and its a great way to use my leftovers. The first two pages are where I share when Coco was born, June 7, 2013 and she weighed 2 pounds and 4 ounces when we got here, so very tiny! Even now it's fun to look back at the pictures and the list I put together. on this page? When I got it in the mail, it was cracked and the company sent me another one so I glued this one together and saved it for this book. Shitz Ysu and Yorkie and will most likely weigh 5 lbs on a good day. and it was so funny watching Coco trying to lug them around. When I went to pick her up, I couldn't believe this was our same puppy! Next page in the Smash book - Halloween. Yes, Coco does have an outfit! In the meantime, I rearranged and reorganized my craft room and began working on some goodie bags made out of envelopes. 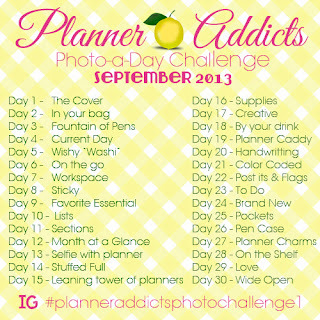 Now that's October, I'm finally getting around to completing the photo-a-day challenge for September. My Filofax is typically in my purse and I can pull it out quickly to write things down. I love cute post it notes that are packaged in a small space with lots of coordinating post it notes in various sizes. This makes for easy decorating the pages in my Filofax! Since my Filofax is small(pocket size) it doesn't lay flat but its still very easy to write down things. visit Sephora or Ulta. Aren't those stores fun to visit? Wishing you a wonderful Wednesday. We're coming down to the end of the photo-a-day challenge for Planner Addicts Facebook Group. Today I wanted to share three days in order to finish up the challenge tomorrow. In October, I'll be concentrating on my Smash book and a birthday banner! pockets to hold clips and some smash post it notes. One thing for sure, this can change weekly depending on what I want to work on while at work. I use this Hello Kitty to tote my pens to work., the little pencil case came from Michaels craft store, I think I paid $2. But I also have a more expensive organizer that I got from Mochi Things and it cost $30.95! The hubby and I were in Las Vegas in March for a spring vacation and I picked up a couple of charms. This is the perfect size for my Filofax and I remember our trip every day! For more Filofax inspiration, click here.